I totally had one of these. It had to be early 80s for me to remember them! I thought it was awesome. I had one of these! I'm younger than you, so early '80s makes more sense for me as well. I don't remember these... must have been a more of an '80s thing. I had one and I was born 1981 so they must have still been around late 80s for me to remember playing it! I had one also. Maybe around 1988?! I remember when the batteries started to wear down it would sound so funny. I had one!! Where are you finding this stuff? I totally had one of these!! I loved it and drove my big sister and probably my parent too crazy! Oh my gosh, I totally had one of these. I think I got it in the mid 80s, probably around grade 2, or 3. I think they were long out of fashion, by then. I had so much fun with it! I forgot they even existed. I had one in the early to mid 80's, my mom got it for me at the flea-market behind Green Acres. born in 84 and i remember these! I had first baught it in 1995 from china and I still have a yellow one and my village brothers had pink ones. I also had a blue with pictures of animals like cat etc. on a transparent compass box. I am from India. I actually have one that looks exactly like this pink one. It's sitting right next to me now. I had one in the early 80's also so when I saw this one cleaning out an attic at a deceased friends house a few years back, nostalgia insisted I hold onto it. But it's just been sitting around for a while now so I'm going to list it on eBay today. If I didn't know better the one I have looks almost new and still works great. 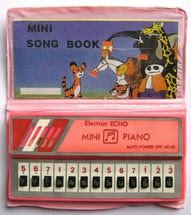 So if anyone's interest just type Electron Echo Mini Piano into the search bar of eBay. Yes i do remember these.. in fact i am still looking for one for my collection. Not only i had a good time with this awesome toy but also this was the foundation stone which marked the beginning of my musical journey and brought me here where i am today.. playing with bands and composing original music. Long live Electron Echo Mini Piano!! Long live the 80's!!!! yes i do remember these from my childhood days..it was late 80's and i used to be glued to this little thingy. Not only i had some really good time playing it, but this awesome toy is also the foundation stone of my musical journey which has brought me to this day when i am playing with bands and composing my original music. Long Live Electron Echo mini piano!! long live 80's!!! This exact one came to mind last weekend when I asked my (older) brother if he remembered them. I know that he & I both had one. We lost EVERYTHING from our childhood, so just seeing these things puts me in a happy place!!! Yes, folks, that is the musical code to Santa Claus is coming to Town. I memorized the crap out of that song on my mini piano and cannot shake it to this day. I'm now 35. Mary had a little lamb :) I'm 32 and taught my 9 year old how to play this way. What great memories....sure do miss this little piano. So glad I found this! They sold them at the little store in my town, so I ended up with a few of them. I was pretty young, so it would've been mid-80's. My cousin & I had a creepy experience with one playing by itself. We broke it & it kept playing on its own, (a weird malfunction, I'm sure, but as little kids it creeped us out.) When I tell that story, & try to describe these tiny little keyboards from the 80's, nobody ever has a clue what I'm talking about. I've googled it a bunch of times & found nothing. I was starting to think our tiny little town was the only place these things ever existed! I remember these! My brother and I both had one. I remember when the battery started getting weak, the sounds would get very strange sounding. I was born in 1979. I loved these!!! I had several different volors with different songs. They sold them in the grocery check out lines for a buck or two.